VietNamNet Bridge – Construction violations ranging from ignoring building permits to illegal construction on farm land remain a hot issue in HCM City. Local authorities were to blame for violations, according to a report by Viet Nam News Agency. Construction inspectors recently uncovered 19 violations at a social housing project in Tan Binh District’s Ward 15. In response, vice chairman of the city’s People’s Committee Tran Vinh Tuyen issued a record fine of VND1.64 billion (US$71,300) to the project’s owners, and looked into who was ‘turning a blind eye’ to these violations. Most of them were only brought to light and addressed after being uncovered by the media, the report said. In District 1, inspectors also recently found that local officials had been unlawfully granting licences for construction projects on main streets in the city centre, such as Nam Ky Khoi Nghia, Le Thanh Ton, Nguyen Trai or Nguyen Dinh Chieu. Most violations related to increasing the number of floors and enlarging balconies and public space. Illegal residential construction on farm land has been taking place for a long time but has been largely ignored. 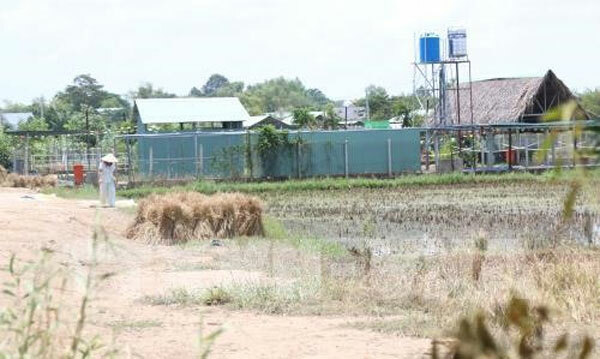 In the latest case, inspectors found violations in Linh Dong Ward, Thu Duc District, but the local People’s Committee had taken no measures to monitor or stop the project. According to a report from the city’s Construction Department, from November 2017 to to May 2018, inspectors uncovered 7,360 violations and fined 3,830 cases. In the first six months of this year, 54 violations were detected in Cu Chi District. Illegal constructions have been on the rise, especially in communes with rapid urbanisation such as Binh My, Tan Thanh Dong, Tan Phu Trung and Tan Thong. Most of the projects reportedly did not comply with permits, but local authorities blamed each other on the problem. Viet Nam News Agency reporters have contacted the head of office of the city’s Construction Department and the People’s Committee of Cu Chi District for further comments, but have yet to receive a reply.